Blog article will help you when it comes to making your decision. First of all, what is a Chesterfield sofa? A Chesterfield sofa is, ultimately, a deep-buttoned, leather sofa that is renowned for its history. The Chesterfield sofa is undoubtedly a classic and a true design icon. “Iconic, classic, yet there seems to be so many variations of the Chesterfield sofa”, we hear you say, but panic not, simply read on to find out more information about the six types of Chesterfield sofas available from Zest Interiors. All of the Leather Chesterfield Two Seater Sofas from Zest Interiors are hand-coated in the finest, highest-quality leather material. In addition, the iconic details of the Chesterfield sofa are finished by hand for a unique look and the best possible standards. All of the Three Seater Leather Chesterfield Sofas from Zest Interiors have been made to the highest quality, with an antique finish that has been hand crafted in the UK. What’s more, we have black, brown, red, green, blue and white leather three seater Chesterfield sofas to choose from, so there is a sofa for all tastes and decors in our collection! Zest Interiors is home to the best value, yet high-quality, Chesterfield Club chairs in the UK. The Chesterfield Leather Club Chair provides a comfortable and stylish seat in any setting, and are available in numerous colours, including red, brown, green, blue, black and white. Chesterfield Leather Sofa Beds are much lesser known but are ideal for when you have guests around to your home to stay. The Chesterfield Leather Sofa Bed will suit those looking for a comfortable seat that can double-up as a large, comfy bed. 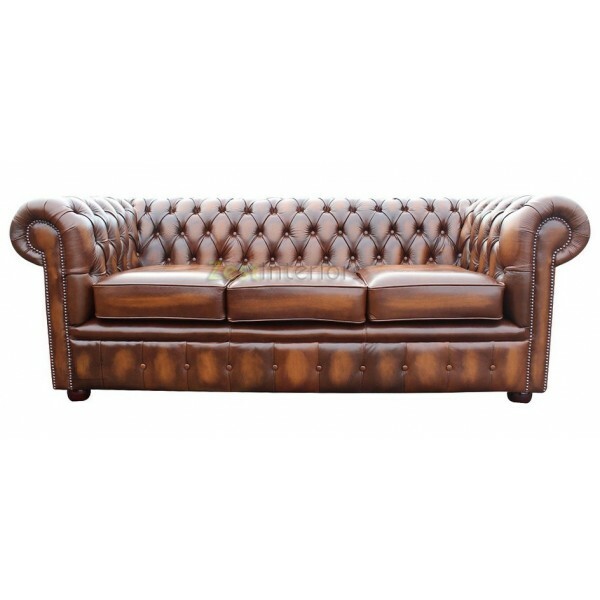 The Chesterfield Leather Sofa Beds are available in both two seater and three seater sofa beds. Upholstered in the finest quality leather, the Chesterfield Queen Anne Armchair is perfect for those looking for tradition and comfort. For the ultimate in iconic style, the Chesterfield Leather Sofa and Chair Sets are handmade with genuine antique leather. A Chesterfield Leather Sofa and Chair Set offers you the opportunity to choose between a Chesterfield Leather three Seater Sofa (with two Chesterfield Club Chairs) and a Leather Chesterfield three Seater Settee with a two Seater Settee. For more information on any of our Chesterfield Leather Sofas, please give us a call on 0800 085 1422.